From the readme, it looks like one of the things it does is allow for more letters in ability and item names? That could be handy. - if this mod require Japan ROM, does that mean you have coded all the routines? - Are you familiar with internals - what format are fonts, font characteristics, widths for VWF and where I can find them in the ROM. No, I'm not that skilled. I think the only real hex editing work I did was pointer editing for battle messages and a search and replace for changing e.g. Butz to Bartz. I used this utility, which modifies the RPGe patch. I just chose to create the IPS file from the japanese ROM for simplicity's sake. Not really. Again I used the previously mentioned utility for this - it allowed me to insert images and widths for the fonts. This also came with .tbl files for the RPGe patch - by default it will generate new .tbl files upon first launch if none are detected. I was able to find a ROM map on the slickproductions wiki (I think) but the site seems to be down (i.e. I can't access it). Bear in mind the utility I mentioned is also hosted on slickproductions. 1. Is there any reason why the enemy Mythril Dragon is Mithril Dragon? It appears that it's based off of the same metal as the weapons you just bought, so... one letter slip-up, I suppose? 2. I mentioned this in the wrong thread earlier by accident, wouldn't MgicShell sound better as MagiShell? It covers the same amount of letters. These are both random minor things though, I haven't run into anything else since right after the Library of the Ancients! 'Mythril' is how Square spells it to avoid irritating the Tolkien estate. Either spelling is fine, frankly. That's true, but it's really more about being consistent. The equipment keeps the "y" currently. Sorry for the doublepost, but I ran into this. I was wondering, is this a bug with the script port or FFV itself? 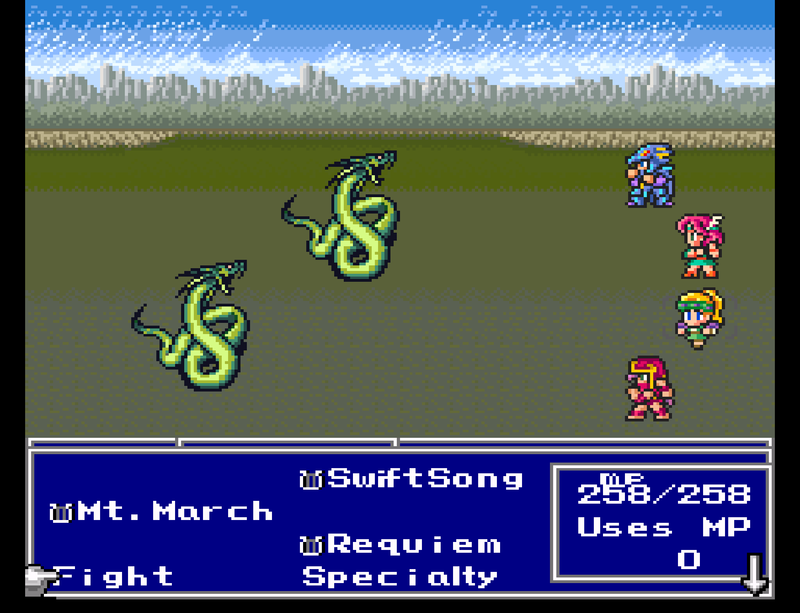 It seems that those extra two commands are the Weresnake's attacks, there's fight and Specialty is Critical Attack? Just finished my second playthrough of this. Aside from being bothered by the mithril / mythril issue that Chronosplit pointed out, the only additional problem I encountered was an out of place ! character at the beginning of the second line of text where Gilgamesh is addressing Faris when he shows up during the battle with Necrophobe. Is there not any other place to grab that FFe Text Editor v1.6 other than slickproductions.org? I've been trying for several days already but the site never seems to be online. Is there any particular reason the editor isn't available for download here in this site? Noisecross is the author of that editor (FF5e Text Editor v1.6), you can try to reach him through his email. I'll send you a PM with it. I like the work made on this patch, but I really really miss the rounded corners of the windows. The rounded corners represent Final Fantasy for me (as silly as that sounds) and I feel something is missing for me with the sharp corners. Is there a way to patch this to get the rounded corners back? - MgicShell changed to Mag.Shell. I just kinda moved on from this and forgot about it, but now I've gone back and fixed those issues. All in all, I think it was a pretty cool project. es. All in all, I think it was a pretty cool project. Absolutely. My wife used your hack for her first playthrough of the game. I'm jealous she got to experience it like that as opposed to suffering through the terrible PSX port like I did. Yes, thanks for coming back around for these final fixes 121J. This project IMO created the definitive version of FF5 in English. I hope you find inspiration for similar projects in the future!